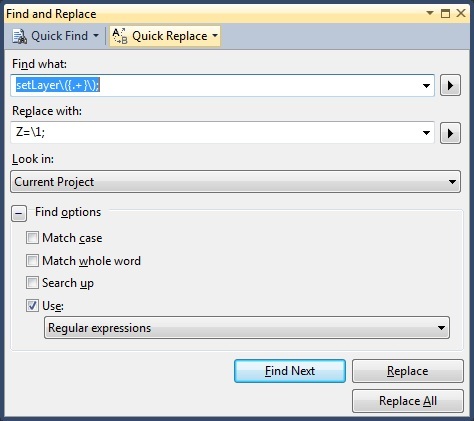 Usually Find/Replace gets the job done for what I need, although sometimes using “Replace All” can break more stuff than it fixes. But today I had this function I wanted to get rid of and simply change it with a public variable. So I had something like this. Now if you notice we have curly brackets around the inside of what the function receives as parameter, that’s because we are tagging that string to use it later. This way on the replace we simply need “Z=” followed by the first tagged string we have “\1″. if we have more curly brackets it would be “\2″, “\3″ etc.